The overarching goal of this project is to better match funding strategies to industry needs to maximise the benefits of R&D to Australia’s infrastructure and building industry. Project partners are: Queensland Department of Public Works; Queensland Transport and Main Roads; Western Australian Department of Treasury and Finance; John Holland; Queensland University of Technology; Swinburne University of Technology; and VTT Technical Research Centre of Finland (Prof Göran Roos). This project has been endorsed by the Australian Built Environment Industry Innovation Council (BEIIC) with Council member Prof Catherin Bull serving on this project’s Steering Committee. This project seeks to: (i) maximise the value of R&D investment in this sector through improved understanding of future industry research needs; and (ii) address the perceived problem of a disproportionately low R&D investment in this sector, relative to the size and national importance of the sector. This research will develop new theory built on open innovation, dynamic capabilities and absorptive capacity theories in the context of strategic foresighting and roadmapping activities. Audit and analysis of R&D investment in the Australian built environment since 1990 – access publically available data relating to R&D investments across Australia from public and private organisations to understand past trends. Examine diffusion mechanisms of research and innovation and its impact on public and private organisations – investigate specific R&D investments to determine the process of realising research support, direction-setting, project engagement, impacts and pathways to adoption. Develop a strategic roadmap for the future of this critical Australian industry – assess the likely future landscapes that R&D investment will both respond to and anticipate. Develop policy to maximise the value of R&D investments to public and private organisations – through translating project learnings into policy guidelines. Phase 1 outcomes will include: (i) a map of the existing research investments; (ii) an audit of R&D investment in this sector through interrogating Australian Bureau of Statistics, Australian Tax Office and Australian and state-based data; and (iii) a strategic assessment of the above inputs to inform the following project phases. Phase 2 outcomes will include national case studies of specific themes of investment, highlighting lessons learned, success criteria and critical challenges. Phase 3 will include: (i) an industry R&D roadmap, responding to likely futures; and (ii) a comprehensive update to the CRC for Construction Innovation’s landmark Construction 2020 report published in 2004. Phase 4 outcomes will include a set of strategies to allow public and private sector organisations to more profitably engage in research to secure business advantages. This project has also formed the basis for a new CIB Task Group, TG85 R&D Investment and Impact, which held its first meeting at SB11 Helsinki World Sustainable Building Conference on 19th October 2011. CIB TG85 members receiving CIB Programme Committee commendation for the most remarkable contributions to the CIB from amongst all the Commission and Theme Group Coordinators and Members at the World Building Congress 2013 (Brisbane, 7 May 2013). 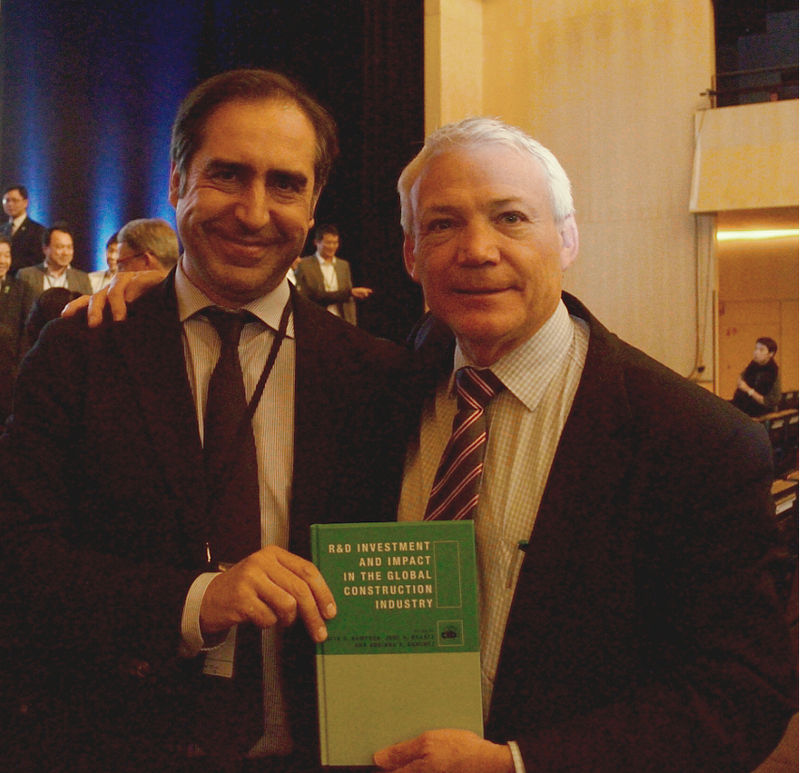 Antonio Lucio Gil, Ex-Vice-President of Green Building Council España and Keith Hampson, CEO of SBEnrc during launch of the book R&D Investment and Impact in the Global Construction Industry, Barcelona, World Sustainable Building Conference, 30 October 2014. Antonio Lucio was responsible for the “Global Vision” at the WSB14. Collaboration is fundamental to our success. You can collaborate with us by either becoming a Core Member of our Centre or becoming a research partner on one or more of our research projects.